Teens and Distracted Driving - DriveTeam, Inc.
People have always found ways to get distracted while driving; conversing with passengers, messing with the radio stations, or eating a meal from the drive-through all take attention away from effectively operating a vehicle. However, in recent years, technology has added even more dangerous distractions. Most specifically, the rise of cell phone use while behind the wheel. Drivers are now able to not only make phone calls while behind the wheel, but they can also browse the internet and read and reply to text messages. Visually: Drivers are looking at their phones and not the road. Manually: One or possibly both hands are off the wheel tapping out a message to someone. Cognitively: As drivers focus on reading and composing a reply, they aren’t thinking about the road ahead of them. 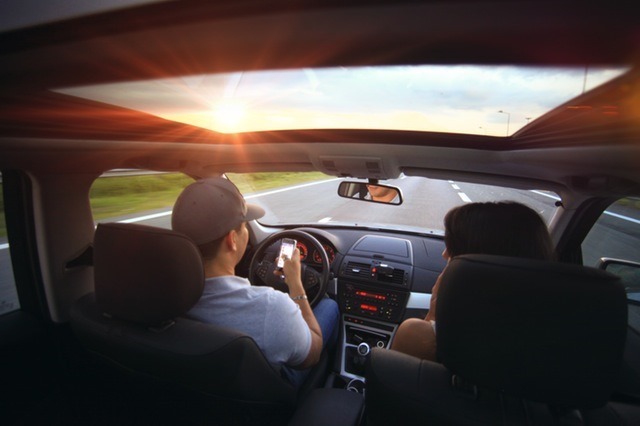 The National Safety Council has designated April as National Distracted Driving Awareness Month to draw attention to this epidemic responsible for the increasing number of vehicle crashes and fatalities over the past several years. As a parent of a newly licensed teen driver, it’s vital to make the pledge with your child to “Just Drive. Teens are notorious for feeling invincible, like a serious car accident couldn’t happen to them. Maybe others can’t handle answering a quick text message while driving, but surely nothing that bad could happen by taking their eyes off the road for just a few seconds. However, when traveling at a rate of 55 mph, just five seconds is enough time to drive nearly one and a half times the entire length of a football field. Parents should know that research shows one quarter of teens respond to a text message once or more EVERY time they drive. In fact, 20% of teens state they have extended conversations via text message while driving. This is why it’s so important to talk to your teen about the dangers of distracted driving and set some ground rules for using their cell phones in the car before they get behind the wheel. First, emphasize that driving is a privilege and not a right. If the rules are broken, their keys will be taken away. Then, explain that there’s a time and a place for multi-tasking, but driving is not one of those times. It’s important to fully focus on the road; cell phones should be put away in a purse or the glove compartment until they arrive at their destination. Not being able to see incoming texts while driving will lessen the need that teens often feel to respond right away. For extra emphasis, rely on the facts about distracted driving that are provided by reputable websites like the NHTSA, the CDC, or Distraction.gov. Drive Team offers teen driving classes to teach young drivers how to be safe, confident and conscientious while behind the wheel. Contact us today for more information.